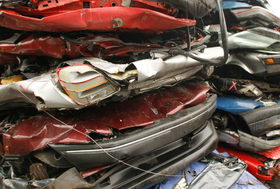 Scrappage incentives have already boosted sales in Germany. The Spanish automakers' association has called for a scrapping incentive in the country after new-car sales there fell in April for the 12th month in a row. Spanish car sales fell 45.6 percent to 67,215 units last month compared with the same period in 2008, according to ANFAC. The organization repeated its call for the Spanish government to implement scrapping incentives similar to those in Germany, France and the United Kingdom to boost demand. "Spain is the only country among the five principal European markets where this type of specific incentive plan for passenger cars does not exist," ANFAC said. Germany and France offer car buyers cash bonuses to trade old cars for new models. The U.K. will launch a similar scheme later this month. In the first four months, Spain's new-car sales have dropped 43.7 percent to 265,210 units, ANFAC said. In Italy, April new-car registrations were down 7.5 percent to 188,406 units compared with the same month last year, according to transport ministry data. The small decline is seen as a positive sign that government incentives to buy new, less-polluting cars are reinvigorating demand. New-car registrations were flat in March, supported from falling by the arrival of the incentives, after a 33 percent fall in January and a 24 percent fall in February. For the first four months of the year, Italy new-car sales fell 16.4 percent to 728,167 units, the transport ministry said in a statement issued on Monday. New-car sales also fell in France in April after showing an increase the previous month. In France, passenger-car sales fell by 7 percent to 184,706 units in April compared with the year before, according to the French manufacturers association CCFA. Overall vehicle sales -- including light commercial vehicles -- were down 11.8 percent to 212,551 units, CCFA said. Car sales had risen 8.1 percent in France in March, helped by the government's scrapping bonus and environmental taxes aimed at promoting sales of fuel-efficient cars. The CCFA said a new system of vehicle registrations introduced last month, as well as some production and delivery difficulties, may have had an impact on the numbers. In France, passenger car sales during the first four months were down 4.8 percent to 690,162, CCFA said. Total vehicle sales for the first four months of the year were down 8.5 percent to 812,078 units. The economic slowdown has hit France's light commercial vehicle market hardest with sales down 34.4 percent in April to 27,845 units. CCFA said that the French data was skewed by the fact that April 2009 had fewer business days than April 2008. Accounting for this difference, it said the passenger-car market was down 2.5 percent and the total market was down 7.6 percent. Citroen was the big winner in April, registering a 10.1 percent sales increase to 29,935 units. Citroen reached a record 16.2 percent market share in April, passing sister brand Peugeot, which controlled 14.7 percent of the French market. Peugeot's sales were down 18.9 percent to 27,196 units in April, while rival Renault was down 6.3 percent to 39,287 units. Renault was the top-selling brand in France, with a 21.3 percent market share in April. PSA/Peugeot-Citroen was the top-selling group with a combined 30.9 percent market share. Renault's overall market share was 23.2 percent after addition of the 1.9 percent share held by its Romanian subsidiary Dacia. The French automakers' total sales were down 6 percent in April, but they combined for a 52.2 percent market share, which was slightly above the 51.7 percent share seen in April 2008, CCFA said. Volkswagen group was the top foreign automaker in France with 20.9 percent sales growth during April. VW group's Audi, VW and Seat brands all reported growth above 20 percent. Hyundai and Ford were the only other carmakers with sales growth during April, CCFA said.